Yo-yo dieting is also called weight-cycling, not because you cycle to lose weight but because your weight moves up and down like your feet when you pedal a cycle. It's usually a substitute for healthy weight loss thru right diet and exercise. Most people who go on a yo-yo diet are those who are either looking for quick weight-loss or are desperate to lose weight, after failing in their earlier attempt(s). When you go on a crash diet (which is becoming quite common today), you can lose a good amount of weight in the first few days. However, this weight loss is largely due to water loss from the body without sufficient calories or nutrients that are required for the body. After some days or weeks, the weight loss stops on a crash diet. At this stage, most people who are on a crash diet go on a binge-eating spree to satisfy their hungry palates. This results in gaining back the lost weight along with some amount of body fat. Yo-yo dieting might happen several times in a lifetime. With each turn of the cycle, it takes longer to lose the same amount of weight and less time to regain it. It is characterised by increased fatness with each cycle. 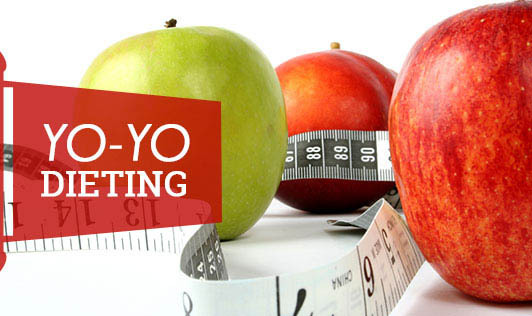 A study has found that "yo-yo dieting" may harm the immune system. • Reduced body metabolism which can last for weeks or months. • Nutritional deficiencies that can include anemia, vitamin, sodium, potassium and calcium deficiencies. It is better to avoid fad diets and just try small changes that are more likely to be able to live with even if the weight loss is slower. Consult your dietitian for a sensible weight loss plan.